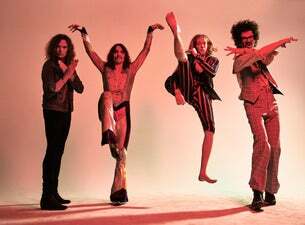 The Darkness have been the surprise rock smash of the UK music scene in recent years. Their debut single I Believe in a Thing Called Love introduced fans to their new take on stadium rock, combining the theatricality of Queen with the energy of Van Halen. The resultant album Permission to Land was a smash hit, spawning hit singles Get Your Hands off My Woman and Love on the Rocks with No Ice. Their spectacular live show has been showcased in recent festival appearances at Glastonbury, The Carling Weekends at Reading and Leeds, Download 2004 and Tennent's ViTal '04 in Belfast.